Home / Archive by category "Volunteer/Travel"
You might remember Sachi's name from our post about her adventures in Wolong a few months ago. Here is a short video of her trip to Sichuan including some of the work she was able to do, footage of the landslides, and OF COURSE, lots of pandas! Lucy Sherrill volunteered at the Bifengxia Panda Base in September of this year. Her travel story was featured in the Virginian Pilot Newspaper. The text reads: China offers many amazing sights, and I will enthusiastically discuss the Great Wall, the terra-cotta army and many others. But getting the chance to work with the pandas at the Bifengxia Panda Center, run by Pandas International, is a memory I will always cherish. We cleaned their enclosures and fed them bamboo, panda bread, carrots and apples. We worked so closely that I now can say I have touched a panda paw. And it didn't take long to become aware of the unique personality of each animal. Thank you, Lucy, for sharing your volunteer story. 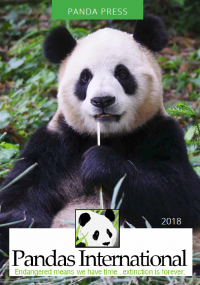 While PI does not run the Panda Center or the volunteer program, we support everything the center does and have participated in the volunteer program numerous times. Our director, Suzanne Braden, was on the tour with Lucy's group. China, November 2013 - Travel Notes After our visit with the bears at the Old Breeding Center, we moved down the hill to the Panda Kindergarten. Who doesn't love watching the panda cubs? During our visit there were only two cubs in the Kindergarten with the other four 2012 cubs having just moved to Dujiangyan (I promise, we'll feature those little ones too). Zheng Zheng and Yi Ran put on quite the show for us. Zheng Zheng is the slightly larger of the two and is quite the acrobat (see video below). He was the first CCRCGP cub to be born in 2012, on July 11, 2012. He is the elder twin of Xi Mei and Lu Lu and the great-grandson of Pan Pan. Yi Ran is the smaller of the two, but don't let that size fool you! When we were watching, Yi Ran finished her milk in record time and went after Zheng Zheng's - pushing him out of the way to get to it! Yi Ran, affectionately called "Dot" thanks to the tell-tale black dot on her forehead, is the elder twin of Shui Xiu. Born on July 24, 2012, she has the distinction of having parents that are both wild born. Yi Ran's mother was rescued from Beichuan on 22 March 2008. She was injured in the wild and lost her front left paw. Her father is Yi Bao, who was rescued as a baby in December 2006 from Baoxing. While he wasn't in the kindergarten while we were visiting in November, we just learned that Jia Jia has moved back to the kindergarten with Zheng Zheng and Yi Ran. We wrote about Jia Jia, Hua Mei's 9th cub, in our Green Lake post. China, November 2013 – Travel Notes Our tour around the Bifengxia Panda Center took us from Green Lake to the Old Breeding Center. At the Old Breeding Center, we met the four current residents – Lu Lu, Qing Qing, Guo Guo, and A Ling. China, November 2013 - Travel Notes Making our way down from the New Breeding Center, our tour took us, next, to the area of the Bifengxia Panda Base known as Green Lake. The origin of the name became quite obvious when we reached the bridge. The Green Lake Area is smaller than the new breeding center with only 4 enclosures. Each, as with all enclosures at the base, with indoor and outdoor areas for the bears. In residence at Green Lake when we visited were three pandas: Hui Hui, Shen Bin, and Jia Jia. Hui Hui was eating when we arrived but came over to greet us. I pulled out my camera, thinking I could grab a quick shot and not disturb him, but as soon as he saw it he came over and posed for us! You may recognize Shen Bin if you've watched the Explore.org cameras in the past. She was on camera for many months last year. During our visit, she was VERY active. Wandering around her enclosure, grabbing a quick bite on the run. I'm not sure she stopped moving once while we were there. Last, but far from least, little Jia Jia. Don't let his diminutive size fool you, this little bear is has a willful and mischievous streak to him! Jia Jia was separated from the other cubs in the kindergarten because of his small stature, but he definitely has a large personality. He entertained us by climbing up his cage, playing with his water bowl, doing somersaults and trying to close the door on us. He's rambunctious and full of energy! And there they are, the fantastic pandas of the Green Lake area. China, November 2013 – Travel Notes If you read our post about Foster Moms, you may have already guessed that we spent quite a bit of time during our first day tour at the New Breeding Center. The center is actually quite large with just over a dozen enclosures, each with indoor and outdoor areas for the pandas. The onsite keepers office is equipped with monitors to keep a virtual eye on the pandas in addition to the staff seeing to their physical needs. The monitors are especially helpful during birthing and the earliest days after cubs are born, when mothers are reluctant to “share” their cubs with the keepers and vets.